I was vaguely aware of this book when it came out, and bought a copy of it back when it was new but never read it. 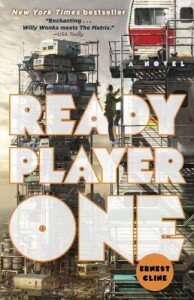 Since the book has been adapted for film, my son - who really isn't much of a reader - decided that he wanted to read it based upon the fact that he liked the trailer. I grabbed the audiobook for him, narrated by Wil Wheaton, and he and my husband proceeded to read it. This book is getting a lot of hate online - a lot of the people I follow on twitter are openly contemptuous of both Cline and Spielberg. And, in a way, I do get that. This book celebrates gamer culture in a way that is very white and very male, even if it does purport to have a number of diverse characters. I grew up in the 1980's and the culture checking is very much of a specific kind - D & D, Rush, Star Wars - the stuff that appealed to young white, somewhat socially inept, males. Of course, the primary theory behind the book is that the puzzle was created by an individual who was a young, white, socially inept male during the 1980's, so I didn't perceive this as especially sinister. I'll talk about the book from all three perspectives. My 17 year old son loved it. He really enjoyed the concepts and found it tons of fun from start to finish. As I said, he is not a reader, so whenever he finds something that he has enjoyed reading, I am excited for him. He is super-excited for the movie, which again is something that I find delightful. My husband is 52. He also very much enjoyed it. He is not especially interested in gamer culture, didn't play D&D growing up, and his attraction to classic geek interests is quite minimal - he was a multi-sport athlete growing up. He loved the references to the 1980's pop culture and felt like the book was basically nostalgia for sport. I also enjoyed the book for the nostalgia factor. I'm not a gamer, and am definitely more of a geek than my husband is, although my interests lean strongly fantasy over science fiction. I turned 14 in 1980, graduated high school in 1984 and college in 1989, so I am right in the wheelhouse for 1980's culture checking. I do feel like Cline's treatment was superficial. There was a lot of other stuff going on in the 1980's that is overlooked because it doesn't really fit neatly into the geek narrative, both in publishing and in other media. I was definitely not a geek in the 1980's - I was a very ambitious, very focused young woman and Cline's 1980's retrospective doesn't have a place for me. But that's sort of the point of the book. It's an easy read - I finished it in under 3 hours (which impressed the hell out of my kid, btw). Some of the gaming parts really drag, and by the end I was tired of the entire thing and skimmed the final battle to get to the win. I can recommend it for what it is - a 1980's nostalgiafest with significant weaknesses. It was fun, but not great. It did, however, make me want to dust off my copy of War Games to watch with my son. I think he'll love it.